Nairobi — Mauritius-based SBM Holdings, through its Kenya subsidiary, has completed the take over of Chase Bank Limited (in receivership). The Central Bank of Kenya and the Kenya Deposit Insurance Corporation (KDIC) signed off on the acquisition. SBM Kenya will acquire selected assets and matched liabilities that include the transfer of 75 per cent of the value of deposits currently under moratorium and the transfer of all staff and branches of the existing Chase Bank Kenya operations. Non-moratorium depositors will continue to have full unrestricted access to their funds. For the 75 percent of moratorium deposits to be transferred to SBM Kenya, 25 percent of each transferred deposit is to be held in a current account with SBM Kenya, with unrestricted usage and without interest being payable thereon. A further 25 percent of each transferred deposit will be held in a savings account with SBM Kenya at an interest rate of 6.65 percent per annum, with unrestricted usage, with the remainder of each transferred deposit to be held on fixed term deposit with SBM Kenya at an interest rate of 6.65 percent per annum. "Such deposits (together with the interest thereon will mature, as to one-third of such remainder, on the first, second and third anniversaries of the transfer respectively," CBK says in a statement. SBM Kenya acquired Fidelity Bank, a tier three bank, in May 2017 and will now merge it with Chase Bank. "With this proposed transaction, SBMH aims at consolidating its presence in East Africa and at gearing up the operations of SBMK, with the ambition of becoming a tier 1 bank in Kenya in the medium to long-term," the group's Chairman K.C Li Kwong Wing had announced in October last year. SBM Holdings won the bid against 12 shortlisted financial contenders for this acquisition including Kenya's tier one banks who see Chase Bank as a salvageable and lucrative financial institution catering for the SME market. 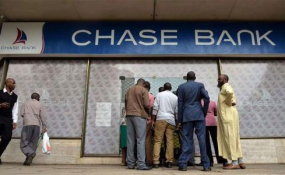 Chase Bank which has been in receivership following its collapse has a network of 62 branches across the country with total assets over $1 billion and employing around 800 staff based on its 2014 annual report. SBM Group is one of the largest banking and financial services institutions listed on the Stock Exchange of Mauritius with a market capitalization of approximately $700 million as at 31 July 2017 and total assets of over $5 billion as at 30 June 2017. It has a Moody's Ratings of Baa3 and is ranked among the top 1,000 banks in the world by The Banker. SBM Group is building its strategic focus on being a strong regional player mirroring the national strategy and building its strength to stimulate growth in Mauritius, India and East Africa.